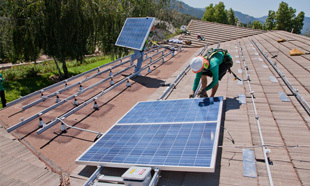 North American Solar Academy’s mission is to deliver the highest quality education in Solar PV Design and Installation. Our program is divided into two components; online e-learning and a 2-day hands-on program. The students learn the science behind solar power, electrical basics, performing site evaluations and the function and integration of all components of a solar powered system, both grid tied and off grid. Starting a new solar business? We can help you with business planning. “Focus Forward for Indigenous Youth’s mission is to collaborate with Indigenous communities across Canada, empowering youth through locally developed trades-based education to strengthen individuals’ and communities’ futures. The North American Solar Academy has a similar focus on education and therefore was a perfect fit compared to other solar installation contractors. Early in our consultation phase with the Wikwemikong community, they had a strong interest in integrating sustainable design and renewable energy into the construction project. They were excited that their youth would have the opportunity to get hands-on experience with Solar PV technology that is quickly being adopted by the community as a whole. Focus Forward explored multiple options regarding the installation of the solar PV system, we knew we wanted to the students to be involved in the installation but had concerns that typical solar contractors would not be focused on educating the students. After a few conversations with Scott Seidel from the North American Solar Academy, I knew their approach would provide the best outcome for the youth. Providing a two day in class training discussing solar and electrical theory and getting hands-on practice on a mock roof and equipment was perfect to build their confidence before they installed the 5 kW PV system on the roof of their high school over the next two days. The students gained valuable skills that are in high demand in their community. The youth that had gone through the North American Solar Academy training in August are being asked to assist the community in installing more solar. “I’d like to take this opportunity to thank you for inviting us to your 2-day course on Solar Energy. Your course was excellent, as you know we already have had a small amount of experience installing solar power systems. What we didn’t know was, well most of what your course teaches in your 2-day session. From design to installation everyone felt confident in their ability to either get their own systems done or design and install as a business, like us! The information was given in a way that allowed everyone to understand at their own pace, your patience with everyone was second to none. Being in a room with others from other demographics as well as other countries was certainly a challenge, but your course managed to correspond to everyone present. “Great Solar Design and Installation Workshop! “I would like to thank you for coming down here to Hamilton to do solar training with us. You included enough information to cover all the basics for those that may not have had any experience with solar power but also included enough information for those with some experience to challenge us and to help give us the information that we were looking for. Your presentation was clear and followed logical steps so that we should be able to make the calculations that we need to do our work in developing countries. I know that it is a lot of work to carry around all of your equipment as well as the roof and all the solar panels but the hands-on is a great addition for those of us who are visual learners. When students have completed the online portion through our training partner Solar Living Institute they will be eligible to write the NABCEP associates exam. When the students have completed the hands-on portion there is an opportunity to observe an actual real world installation onsite. We have developed the program to be as convenient as possible to the students. The online portion can be done anytime and it generally takes 20-25 hours to complete. Students have access to all the modules for 1 complete year for easy reference and review. We encourage our students to ask questions and share experiences. Small class sizes allow us to ensure each student understands the content being taught and enables us to spend time with everyone’s particular area of interest. See what our past students have to say; we are constantly updating our program to ensure our students get the best solar educational experience possible. We have helped many students after they have completed the course with design and installation issues. Our support does not stop when the class is over. The two-day hands-on portion of the program enables students to learn how to perform site evaluations, learn the function of all the solar components and install a roof, pole and ground mounted system. The students learn both grid tied and off grid solar powered systems. The cost of our course is a fraction of what other programs offer. When the students have successfully completed the online portion they can pursue their NABCEP certification by writing their entry level exam and begin the process of becoming a fully certified NABCEP professional. Having registered for the course in The North American Solar Academy enabled me to enhance my technical skills and gain more knowledge in the PV System Design including grid tied and stand alone applications. Scott is an excellent instructor to teach the materials during the 2 days hands-on workshops, very skilled to explain the calculation for the PV Design as well. In addition to learning about the solar installation's process and the used components, the students take part in the roof, pole and ground mounted solar installation under the supervision of Scott after he demonstrates and explains how to perform it. One of my best choices to take a course in solar energy design and installation. Highly recommanded. Souad L.
The North American Solar Academy’s delivers the highest quality education in Solar PV Design and Installation. The students learn the science behind solar power, electrical basics, performing site evaluations and the function and integration of all components of a solar powered system, both grid tied and off grid. Great crew!